George Dunning 's name became known to the wider world in 1968 with the release of the wildly popular and influential Beatles animation extravaganza Yellow Submarine , produced by Dunning 's company T.V.C. London . He served as the overall director, supervising the army of over 200 artists entrusted with realising the film in the frighteningly brief period of eleven months. He also conceived and took personal charge of the 'Lucy in the Sky with Diamonds' sequence. 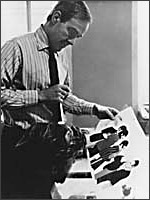 Photographs and behind-the-scenes footage suggest that throughout production Dunning was the only animator on the staff who wore a suit. The title of Paul Madden 's TV portrait of Dunning , made for Channel 4 in 1991, encapsulates his posthumous reputation: he was 'The Man Who Moved the Beatles'. But animation connoisseurs knew of Dunning 's achievements long before Yellow Submarine premiered in London. Born in Toronto on 17 November 1920, George Garnett Dunning first made his mark at the National Film Board of Canada among the animators grouped around Norman McLaren . He had joined the Board in 1943 after study at the Ontario School of Art and freelance work as an illustrator, and directed his first film the same year, Auprès de ma blonde , one in a series of 'Chants populaires'. But it was Cadet Rousselle in 1947 that pronounced the arrival of a distinctive talent, especially keen to develop new techniques. Instead of conventional animation, the film used flat metal figures, treated almost as puppets, their position altered frame by frame. Further experimentation followed in 1948, during a year spent working for UNESCO in Paris; he painted designs onto glass (a favourite technique), and absorbed advice from the Czech-born animator of L'Idée (1932), Berthold Bartosch . Returning to Canada in 1949, Dunning secured a grant from the NFB to continue his experiments with painting on glass. To cement his livelihood, he formed the company Graphic Associates with another former NFB artist, Jim McKay , and began to generate the commercials and industrial spots that provided his life's bread and butter. After working on UPA 's Gerald McBoing Boing television show in New York, he arrived in Britain in 1956 with the job of managing UPA 's new London office. This London off-shoot collapsed after seven months, but from the nucleus of UPA staff Dunning set up T.V. Cartoons (after 1961, T.V.C. London ), one of several animation companies formed to satisfy the new demand for TV advertising. Talents working with Dunning included Richard Williams and Teru Murakami . Among the mountain of commissioned work - commercials for Mother's Pride bread, Start-Rite shoes, even Mentholatum Deep-Heat Rub - Dunning slowly began to generate his own personal short films, beginning in 1958 with The Wardrobe . In these films Dunning 's style is in marked contrast to the Pop Art and psychedelic abandon of Yellow Submarine . Initially Dunning favoured lean lines and spare backgrounds: the need for financial economy played a part, but it was style entirely suited to the absurdist comedy of Stan Hayward 's scripts. The Wardrobe , set against a white background, features the comings and goings of two men, a wardrobe, and two pairs of shoes. The Apple (1962), winner of a British Film Academy award, concludes a man's Herculean efforts at snatching an apple from a tree with the droll revelation of a secret attic containing an arrow, a small boy, and dozens of split apples on the floor. The hero's design is typical: the head and body fused in a potato-shaped whole, with a bow tie perched half-way down, and nose, eyes and hair clumped together on top. He could easily have stepped out of a magazine cartoon. In The Flying Man (1962), Dunning revisited his experimental impulses, delineating characters and props - a man who can fly, a man who cannot, a coat, a dog - through loose watercolour brushstrokes floating in space without any defining lines. Witty and technically innovative, the film won the Grand Prix at Annecy's International Animation Festival. The Ladder (1967) further developed the brushstroke technique in a story with the 'eternal triangle' theme. These films established Dunning alongside Richard Williams and Bob Godfrey as a major new voice in British animation. In between these personal shorts, T.V.C. London ploughed ahead with the daily grind, producing about 100 commercials a year in the '60s, along with eight films for the National Coal Board 's work safety campaign, featuring the characters Thud and Blunder. Producing Canada Is My Piano , a triple-screen film for the Montréal 1967 Expo, provided Dunning with a greater challenge. His managerial skills were also tested with The Beatles and Cool McCool , two animation series aimed at American television. The Beatles episodes featured animated Beatles figures in brief domestic comedy scenes, usually pegged to a particular Beatles song. The challenge for Yellow Submarine , commissioned by King Features in America, was to find a storyline and a visual approach capacious enough to sustain a feature and embrace a dozen Beatles songs. Dunning decided to go for variety, rotating the graphic style with each song, consciously using the film to showcase the wealth of visual techniques available in the late 1960s. Throughout, Dunning worked closely with his art director Heinz Edelmann , the German poster artist whose boldly coloured, 'trippy' designs generated much of the film's power and cult following. Other key contributions were made by Charles Jenkins , responsible for specific technical effects; animation directors Robert Balser and Jack Stokes ; Erich Segal , who shaped much of the final script; Alison de Vere , the chief background supervisor; and, as line producer, John Coates , Dunning 's partner at T.V.C. since the beginning. For 'Lucy in the Sky', annoyingly brief in its finished form, Dunning returned to the brushstroke technique of The Flying Man and The Ladder . The paint is overlaid on rotoscoped images derived from live-action footage featuring carousel girls from MGM 's musical Dancing Lady and Fred Astaire dancing 'Cheek to Cheek' with Ginger Rogers - the whorls and splotches continuously changing colour and shape as the song progresses. Dunning 's carnival of new techniques in Yellow Submarine and his other films greatly influenced other talents, and extended the horizons of British animation. But the success of Submarine brought no direct financial reward: T.V.C. London made the film for a fixed fee, soon exceeded when the production went over-budget. Back at the grindstone, Dunning directed more safety films for the National Coal Board . Greater satisfaction resulted from the 'say no to drugs' animation The Maggot (1973; another Annecy prize-winner) and his powerful treatment of Andrew Marvell 's pastoral poem, Damon the Mower (1972). The film proceeds through numbered graphite sketches, the rostrum camera deliberately positioned to capture both the mechanics and the magic of the animation process. After Damon , Dunning began to lay plans for a feature based on Shakespeare 's The Tempest. Dunning had been unwell throughout the production of Yellow Submarine , and poor health continued to dog him. When he died in London on 15 February 1979, The Tempest remained sadly unfinished. The collated surviving material - black-and-white pencil tests, pose sketches, a few full-colour animation sequences - hints at a bold expansion of past techniques, with figures, landscapes, even the Shakespeare text, in perpetual flux. A cartoon film about two miners who disobey safety rules underground.